Paula Fraile, Painting | Spain[/cs_text][/cs_column][/cs_row][cs_row id=”” class=” ” style=”margin: 0px auto; padding: 0px; ” visibility=”” inner_container=”true” marginless_columns=”false” bg_color=””][cs_column id=”” class=”” style=”padding: 0px; ” bg_color=”” fade=”false” fade_animation=”in” fade_animation_offset=”45px” fade_duration=”750″ type=”1/1″][cs_text id=”” class=”” style=”” text_align=””]With an immense amount of effort from a team of close to 75 people – Preet Nagar Residency was restored and made more liveable & loveable. 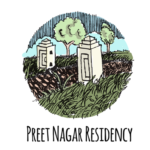 Remaining true to the old aesthetic and the vision of Preet Nagar – this community of artists was brought alive by our residents as we all worked by day and caught up over bonfires, warm conversations over beaten coffee and long evening walks in the fields. [/cs_text][/cs_column][/cs_row][cs_row id=”” class=” ” style=”margin: 0px auto; padding: 0px; ” visibility=”” inner_container=”true” marginless_columns=”false” bg_color=””][cs_column id=”” class=”” style=”padding: 0px; ” bg_color=”” fade=”false” fade_animation=”in” fade_animation_offset=”45px” fade_duration=”750″ type=”1/1″][x_image type=”none” src=”http://preetnagarresidency.in/wp-content/uploads/2016/05/dusk.jpg” alt=”” link=”false” href=”#” title=”” target=”” info=”none” info_place=”top” info_trigger=”hover” info_content=””][/cs_column][/cs_row][cs_row id=”” class=” ” style=”margin: 0px auto; padding: 0px; ” visibility=”” inner_container=”true” marginless_columns=”false” bg_color=””][cs_column id=”” class=”” style=”padding: 0px; ” bg_color=”” fade=”false” fade_animation=”in” fade_animation_offset=”45px” fade_duration=”750″ type=”1/2″][x_image type=”none” src=”http://preetnagarresidency.in/wp-content/uploads/2016/05/10683511_10153966698231613_5940779988389451429_o-1.jpg” alt=”” link=”false” href=”#” title=”” target=”” info=”none” info_place=”top” info_trigger=”hover” info_content=””][/cs_column][cs_column id=”” class=”” style=”padding: 0px; ” bg_color=”” fade=”false” fade_animation=”in” fade_animation_offset=”45px” fade_duration=”750″ type=”1/2″][x_image type=”none” src=”http://preetnagarresidency.in/wp-content/uploads/2016/05/Horseman-2-1.jpg” alt=”” link=”false” href=”#” title=”” target=”” info=”none” info_place=”top” info_trigger=”hover” info_content=””][/cs_column][/cs_row][cs_row id=”” class=” ” style=”margin: 0px auto; padding: 0px; ” visibility=”” inner_container=”true” marginless_columns=”false” bg_color=””][cs_column id=”” class=”” style=”padding: 0px; ” bg_color=”” fade=”false” fade_animation=”in” fade_animation_offset=”45px” fade_duration=”750″ type=”1/1″][x_image type=”none” src=”http://preetnagarresidency.in/wp-content/uploads/2016/05/evening-walks.jpg” alt=”” link=”false” href=”#” title=”” target=”” info=”none” info_place=”top” info_trigger=”hover” info_content=””][x_image type=”none” src=”http://preetnagarresidency.in/wp-content/uploads/2016/05/verandah-1.jpg” alt=”” link=”false” href=”#” title=”” target=”” info=”none” info_place=”top” info_trigger=”hover” info_content=””][x_image type=”none” src=”http://preetnagarresidency.in/wp-content/uploads/2016/05/cycling-n-rain.jpg” alt=”” link=”false” href=”#” title=”” target=”” info=”none” info_place=”top” info_trigger=”hover” info_content=””][/cs_column][/cs_row][cs_row id=”” class=” ” style=”margin: 0px auto; padding: 0px; ” visibility=”” inner_container=”true” marginless_columns=”false” bg_color=””][cs_column id=”” class=”” style=”padding: 0px; ” bg_color=”” fade=”false” fade_animation=”in” fade_animation_offset=”45px” fade_duration=”750″ type=”1/1″][x_text_type prefix=”Interactive installation” strings=” by Sadhana” suffix=”at Jehangir’s Aaram ghar” tag=”h3″ type_speed=”50″ start_delay=”0″ back_speed=”50″ back_delay=”3000″ loop=”false” show_cursor=”true” cursor=”|” looks_like=”h3″][/cs_column][/cs_row][cs_row id=”” class=” ” style=”margin: 0px auto; padding: 0px; ” visibility=”” inner_container=”true” marginless_columns=”false” bg_color=””][cs_column id=”” class=”” style=”padding: 0px; ” bg_color=”” fade=”false” fade_animation=”in” fade_animation_offset=”45px” fade_duration=”750″ type=”1/1″][cs_text id=”” class=”” style=”” text_align=””]Sadhana ended her stay at the residency with an installation at Jehangir’s Rest House in Preet Nagar. She wanted to explore an imaginary conversation that Noor Jehan could have had with her lover Jehangir, asking him why he was brutally punishing the Sikh Gurus and their children. [/cs_text][x_image type=”none” src=”http://preetnagarresidency.in/wp-content/uploads/2016/05/Sadhana-installation.jpg” alt=”” link=”false” href=”#” title=”” target=”” info=”none” info_place=”top” info_trigger=”hover” info_content=””][x_image type=”none” src=”http://preetnagarresidency.in/wp-content/uploads/2016/05/Paramatma2.jpg” alt=”” link=”false” href=”#” title=”” target=”” info=”none” info_place=”top” info_trigger=”hover” info_content=””][/cs_column][/cs_row][cs_row id=”” class=” ” style=”margin: 0px auto; padding: 0px; ” visibility=”” inner_container=”true” marginless_columns=”false” bg_color=””][cs_column id=”” class=”” style=”padding: 0px; ” bg_color=”” fade=”false” fade_animation=”in” fade_animation_offset=”45px” fade_duration=”750″ type=”1/1″][cs_text id=”” class=”” style=”” text_align=””]Sadhana worked on a sound art piece using electronic sound and the harmonium along with her studies of the Sikh texts of Gurbani. An audience of the local community later was requested to write a love-note to anyone they wished. Women wrote to their brothers, grandmothers & grandfathers wrote to their long lost friends , children wrote to their mothers and young men wrote to lovers they haven’t yet met.